The Big Bounty Hunter Machete presented by Tomahawk delivers a stout, full-tang stainless steel blade with a razor-sharp edge. It will clear brush, slice through small limbs, and just get the job done!. 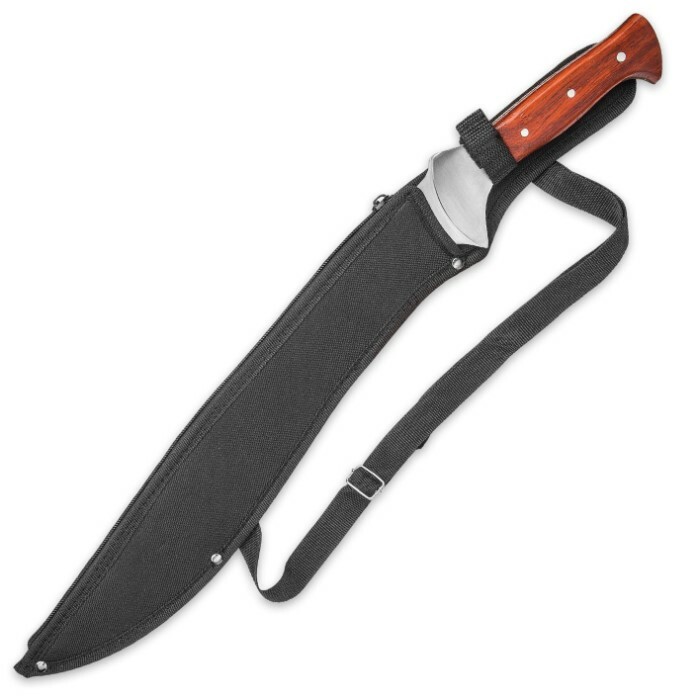 The massive blade features a 13" sharpened edge with a modified clip point design. The tang is encased in smooth wooden handles for a secure, firm grip. A nylon shoulder sheath completes the package. While I like the heft of the blade there is very little balance to it. Must absolutely be paying close attention to your surroundings and the swing or the imbalance will cause the tool to get away from you. The guards are glued on, no pins or welding, so they will come off after enough use. Handle is a bit long, so if you have a large hand (i.e. Wide) you're good to go, otherwise slippage will occur during use if you don't keep a tight grip. OK: this is definitely the nicest machete I have ever beheld. The design is almost elvish, and the feel, weight and balance are zen-like. I'm in heaven! BudK hit this one outta the park! This blade seems awesome, but has some issues. I can cut through a 3-4" price of live bamboo with one clean wack. If I cut a piece of bamboo that is under 1" it bent the blade, only on the bevel. It looked as if I had pressed my finger on the blade and pushed part of the bevel over. I know this is cheap but I did expect slightly better than what I got. Also the handle scales broke free after 25 bamboo stalks. If you just want to hang it on the wall, awesome. If you are looking for a tool, negative. 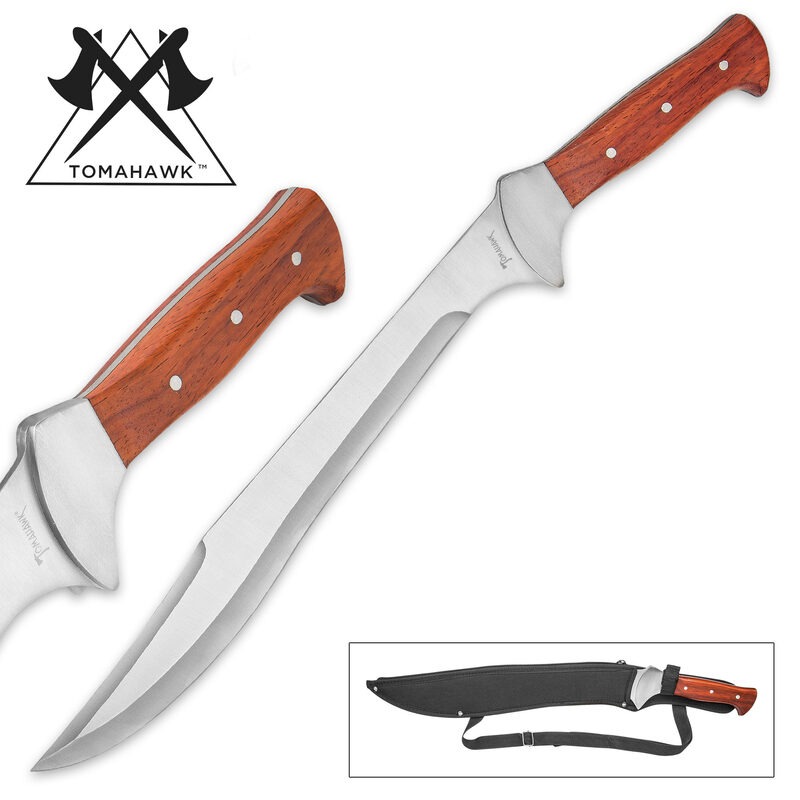 Tomahawk Big Bounty Hunter Full Tang Machete With Sheath. I was really surprised when I opened the box and lay my eye's on the Machete! I had to find out how sharp it was and just about found out the hard way, it's very sharp right out of the box. Now the Sheath, they could of kept the sheath because it's hardly worth putting the Machete into it. Cheap, Cheap...................Love my new Machete and for the price you can't go wrong! Got my Tomahawk machete/knife ! What can I say. Absolutely one of my favorites,Big,strong,& INTIMIDATING ! All my knife collecting friends want one,I told them about Kennesaw Cutlery ! Fast shipping & great service.Watch out Kennesaw,this Tomahawk is about to take off !! What can I say that hasn't already be said except this knife not only looks good it cuts well. Mine was sharp "out of the box" and it actually looks better than the advertised picture. This is a good buy and a welcome addition to my collection.